It gets even better, as the authors explain how a courtroom evidence rule could be used to turn this situation around. I thoroughly recommend reading this article, as it brings together a number of key areas of evidence, and is one of the clearest and most quotable pieces I have ever read on this topic. “It is far past time for birth-related professional organizations to confront electronic fetal monitoring reality, abandon the electronic fetal monitoring ship, and start over. Birth-related professional organizations must come to grips with the undeniable evidence that electronic fetal monitoring is an epic medical ethical dichotomy—it harms mothers and babies in direct opposition to the long-made promise not to do so. The time to act is now. If not now, when?” (Sartwelle and Johnston 2014). The cardinal driver of cerebral palsy litigation is electronic fetal monitoring, which has continued unabated for 40 years. Electronic fetal monitoring, however, is based on 19th-century childbirth myths, a virtually nonexistent scientific foundation, and has a false positive rate exceeding 99%. It has not affected the incidence of cerebral palsy. Electronic fetal monitoring has, however, increased the cesarian section rate, with the expected increase in mortality and morbidity risks to mothers and babies alike. This article explains why electronic fetal monitoring remains endorsed as efficacious in the worlds’ labor rooms and courtrooms despite being such a feeble medical modality. It also reviews the reasons professional organizations have failed to condemn the use of electronic fetal monitoring in courtrooms. The failures of tort reform, special cerebral palsy courts, and damage limits to stem the escalating litigation are discussed. Finally, the authors propose using a currently available evidence rule—the Daubert doctrine that excludes ‘‘junk science’’ from the courtroom—as the beginning of the end to cerebral palsy litigation and electronic fetal monitoring’s 40-year masquerade as science. Why I left my midwifery training – I couldn’t get it out my head that every time I strapped a women to this machine I was starting the process that would lead to a section, and I couldn’t see why I was doing it. Having limited knowledge of this – can anyone give me examples of where this machine may actually be of use? Thanks for these articles Sara. This is a very important argument and one I have regularly. One of my favourite publications is the one below by Wood who discusses in detail the moral conundrum faced by midwives in ethical decision-making around the use of CTG monitoring. I really hope that midwives read these arguments and think hard about and talk with women about informed choice then stand firmly beside women when their informed decisions are made. I know it is not easy in the are made risk averse, dominant medical cultural contexts of out institutions maternity environments, but we must remember that the woman is at the centre of our care. Wood, S. (2003). Should women be given a choice about fetal assessment in labour? MCN, 28(5), 292-299. 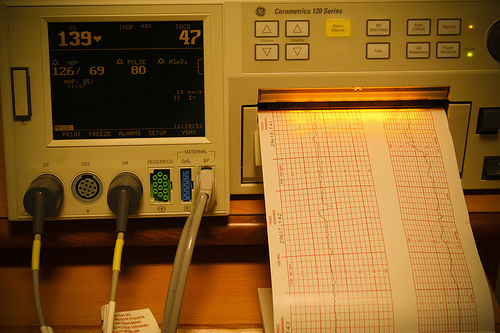 ABSTRACT Continuous electronic fetal monitoring (EFM) in labor is one of the most commonly used interventions during intrapartum care. However,randomized controlled trials, observational studies, and meta-analyses about the use of continuous EFM on low-risk intrapartum patients have found no significant differences in infant outcomes between infants whose mothers had EFM or intermittent auscultation (IA) of the fetal heart rate. In addition, research shows a higher incidence of cesarean birth when EFM is used. Although evidence-based practice is supposed to be our goal, the evidence about the lack of efficacy of EFM has not been used in practice. In fact, EFM has become the standard of practice in this country. Considering these facts,should EFM continue to be the standard of practice for low-risk laboring women? Is informed consent indicated, giving women the choice between EFM and IA? Should IA be offered to all low-risk laboring women? Ethical decision-making models are used to examine those questions and to help nurses better delineate their advocacy role. Key words: informed consent, electronic fetal monitoring (EFM),intermittent auscultation (IA). I stumbled across your website and wow! Love it! This is a great article. I love the quotes you chose to share. I do not understand this debate. Who ever thought, we can use any method during labour and delivery to lower an incidence of anything, for what labour and delivery is mostly not the reason? Cerebral palsy is over 90% produced with brain insults during pregnancy, either severe IUGR, pre-eclampsia, abruption of placenta, TTTS or TAPS in monozigotic twinns, very low birth weight, prematurity, jaundice after birth, etc. and is very rarely caused with a not optimal course of labour and delivery. CTG is still a very useful tool for easier monitoring of sudden unpredicted insults during delivery and as such it should be seen and nothing more. Every suspicious case of delivery in contrast should be checked for pH and other arterial and venous gases as pCO2, base excess, pO2 etc. In any case, only intermittent auscultation (IA) during labour and after every uterine contraction is not better than CTG, probably worse and mostly it gives a much less quality of documentation about changes during labour. Who had to change in this story would be the lawmakers, who have misused and still massively misuse information of a monitor (CTG) for their profit without scientific proof of giving information, which never was promised. The problem I see is not in usage of CTG, but in expecting something, that CTG can not give or even in interpreting its script as a predictor for cerebral palsy. It is simply not a tool for predicting CP, but only to monitor fetal stress and distress, what could be in certain circumstances, but only in certain circumstances also a predictor for brain damage. Not using CTG brings us not any closer to anything valuable for women and their children. Yes, maybe it would bring less reason for urgent CS and other interventions, but I am not sure, that litigations would diminish their course. In any case, women are those, who use litigations against their health providers and if they did it until now for CP, they believed it can be prevented with CTG, they will continue to do so even more in cases they believe, with usage of CTG it could be prevented, but it was not used. I personally use blood gas analysis in every case of delivery in which a baby does not reach a Apgar score of minimal 8 and I have never had any problems with proving adequate management of labour & delivery, whatever happened before or afterwards. It broke my heart to watch a mother’s contractions literally stop every time she was strapped to the monitors. Every. Single. Time. Very interesting article indeed. I came across it as I’m researching my options for my monochorionic, diamnotic twins with regards to EFM and IA. Would you have any info on that? I hate the thought of EFM, but my consultant claims that even by using two Doppler’s they cannot be sure they’re picking up two different heart beats and without a cardio-tocograph they wouldn’t pick up if one or both babies became distressed. Any info on this would be much appreciated. Thanks. Strap a mother to a monitor is barbaric. I can’t believe this is still done in 2014! It’s the most useless, uncomfortable and stupid piece of junk you can have in a birth suit. Yet, midwives self called “engaged”, “alternatives” and even “client centred” still persuade women to use it “it has it’s place”, “it can save lives” in many hospitals, birth centres and MGP programs in Australia. The design of this thing hasn’t changed/improved since my first baby 30 years ago! It often slips out of place and I assisted a mother in labour who moved a lot and every time the baby moved and the machine lost the baby’s heart (with mum and baby moving, this would happen every 10 minutes) the mother would panic thinking the baby was in distress, and labour would stop or go backwards!!! (yes, labour can go backwards!). So, thank you Sarah for your article, just wanted to ask why do you say that the machine is only useless for low risk women (and what is low risk… for some a vbac is hight risk, for others a 4vbac is not, for some 35yo is high risk, for others 45 is not… for some breech, twins, all of this is not low risk, for others it’s just nature in it’s different forms and presentations). I think this machine has no use in any scenario and after a lot of research my conclusion is that it has been used by lack of knowledge, compliance, fear, instead of logic intelligence wisdom and common sence. And respect for mother and baby. it should be thrown in the bin or put in a museum.